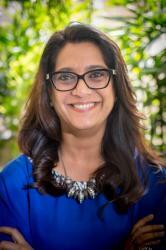 Rachna Khanna is the Founder Director of Pinwi (Play Interest Wise). An entrepreneur and innovator at heart, driven by her own life experience Rachna started her journey in the child development space in 2013. She founded Hatch Tact Innovations Pvt. Ltd.in 2015 to start Pinwi with the purpose of bridging the gap between careers and interests. Rachna started her career in the field of brand communication and experiential marketing, and has an extensive and diverse experience in the Media and Marketing industry spanning over 12 years. She has been instrumental in creating and implementing innovative consumer and channel marketing solutions for multiple Brands across a spectrum of industries. A graduate from the University School of Architecture Planning, Rachna has a degree in architecture with a specialization in creative concepts and communication. She further pursued Senior Management Development Training Program from IIM Ahmedabad and then went on to New York University to study Digital Media Marketing.